This week the Open University released the second in a series of excellent primers on microgravity – this time, looking at how the evocatively nicknamed Vomit Comet – AKA parabolic flights – can help scientists understand how planets form. 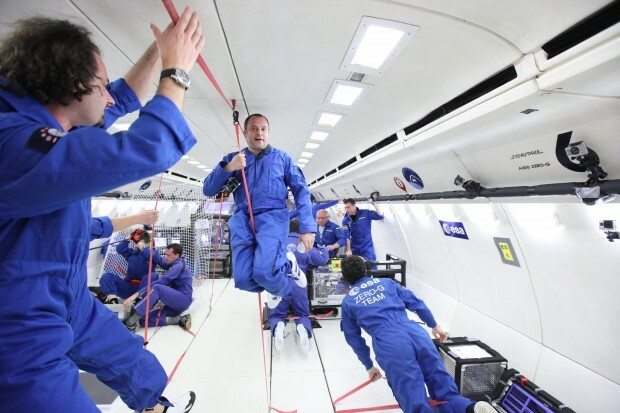 Parabolic flights are used by scientists from all disciplines – they are a handy way of getting rid of the effects of gravity, so that we can study physical processes in a weightless environment. The period of weightlessness is only about 22 seconds, but this is long enough for many experiments to get good observations, and the flights make several arcs (about 30 per flight, for a combined total of more than 10 minutes of microgravity), allowing for repetition and modification of the experimental conditions throughout the flight. These flights are also used to test new technologies for space missions – it’s much cheaper to discover something doesn’t work without gravity before sending it into space. As referenced in the video, Helen Fraser and her team at the OU have used parabolic flights to test fundamental principles of how planets form in the early stages – how individual grains and particles of ice or dust stick together. This may sound like a fairly basic question, but there is a gap in our current understanding of just how the smallest bits of stuff in the universe first aggregate together. 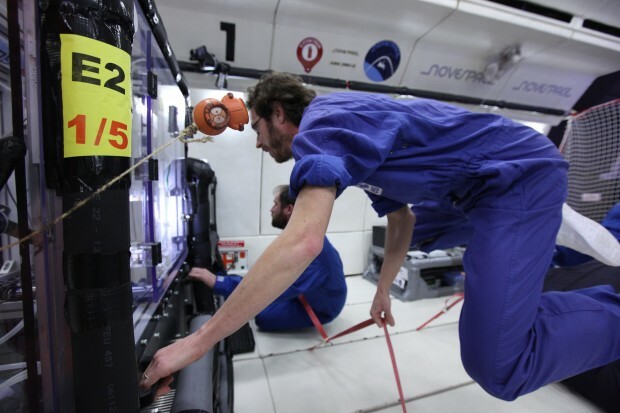 Dr Fraser and her team designed a set-up for one of ESA’s parabolic flight campaigns, operated by Novespace in Bordeaux. Their experiment saw small pieces of ice fired at each other, at relatively low speeds and observed by two high speed cameras, to test whether they would stick together or bounce. After hundreds of repetitions on successive flights, the discovery was that they bounced. This has implications for current theories of how planets first form, and the physical and chemical processes at work. In turn, this will help us better understand how our own planet and Solar System came into being – and, ultimately, provides another piece to the jigsaw of one the most enduring questions: where did life come from? 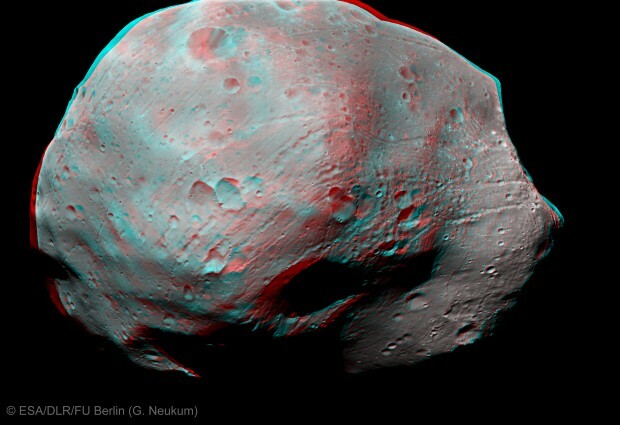 Phobos in 3D, as seen from ESA’s Mars Express orbiter. Image credit: ESA/DLR/FU Berlin (G. Neukum). They have also used this knowledge to design potential instruments for planetary exploration missions. If you want to take samples from a place like Phobos (one of the two moons orbiting Mars) where there is very low gravity, you need to know how material behaves in order to design the appropriate instrument – otherwise your robotic explorer may be scrabbling around in the dust and returning little of scientific interest. UK Space Agency funding has enabled Dr Fraser to study this question in collaboration with engineers from Airbus Defence and Space. Another exciting recent project is led by Marco Marengo, a professor from University of Brighton. Last year, Professor Marengo and his team flew on several parabolic flights to conduct some new research in thermal engineering. 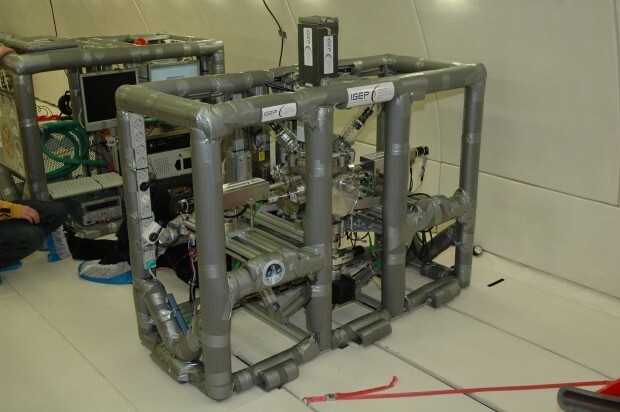 They are interested in how the behaviour of fluids changes in microgravity – and how these changes might be exploited for innovative thermal management systems. Even though a lot of these ideas can now be tested through computer simulations, in this case the processes involved are so complex that the only way to get truly reliable results is to fly some hardware in microgravity. The principle of a “pulsating heat pipe” is to use phase change and vapour expansion as a motor for moving a fluid in a closed serpentine, like in a radiator. There is no pump, no compressor and the system is highly reliable and durable. Hard at work in microgravity. Image credit: Novespace, Bordeaux. It might sound like a niche pursuit, but there are many practical applications. This work could lead to significant advances in how spacecraft are thermally controlled – a very important feature of all spacecraft, as they must contend with the extremes of temperature experienced beyond the Earth’s atmosphere. Such systems will be particularly useful for modern satellite broadcasting satellites, as well as enabling light, modular and easily deployed solar panels for spacecraft exploring other planets. Besides use in space, the understanding of how heat and mass transfer occurs in miniaturised systems will lead to greater efficiency on the ground: for example the pulsating heat pipes are already proven to be innovative passive systems for turbine cooling, solar panels for hot water, electronic cooling and so on. So, if you can hold down your dinner (or don’t mind losing it), parabolic flights are a pretty useful way to study space-like effects.